When you have been doing bicycle culture for a while, things tend to get easier and more straightforward. In a country where design is an integral part of daily life, things become even more functional and simplified. 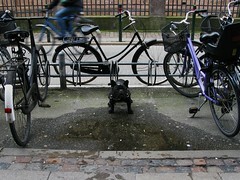 The City of Copenhagen has a Design Manual that covers all aspects of the urban landscape. The document title, when translated, is Design Manual for Urban Spaces and Parks. It's in Danish, not suprisingly, and the pdf can be viewed/downloaded here. There is also a document entitled Design Policy for Urban Space in the City of Copenhagen (a pdf as well), which deals with identity and more overall philosophy regarding our urban spaces. The aforementioned Design Manual is more concrete. It spells out, in no uncertain terms, the design guidelines for the city. From style of garbage cans and manholes to the construction of bicycle infrastructure. On the subject of infrastructure, the Manual is refreshingly simple. You may recall that there are only four types of bicycle infrastructure in Denmark (and only four) so there isn't really a need for overcomplicating what is a simple concept - if you want it to be. 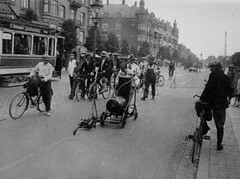 In this photo, cycle lanes are being marked out in about 1915 in Copenhagen. A century of experience lies behind the simplicity of the Manual. It may be interesting to have a look at the material in the Manual regarding bicycle infrastructure and bike racks. With the continued rise in bicycles as transport in cities, there is still an enormous amount of overcomplication. Despite the fact that bicycles were normal in cities around the world for decades, many cities seem to have a short memory and are trying to reinvent the wheel. It's much more simple than that. And in the interest of building a culture of Citizen Cyclists by providing them with the best solution possible from the word go, borrowing freely from a city that has been at it for a while - and that has made all the mistakes and fixed them - is not a bad idea. Not to mention the most cost-efficient way to do things. Important in cities with strained budgets. 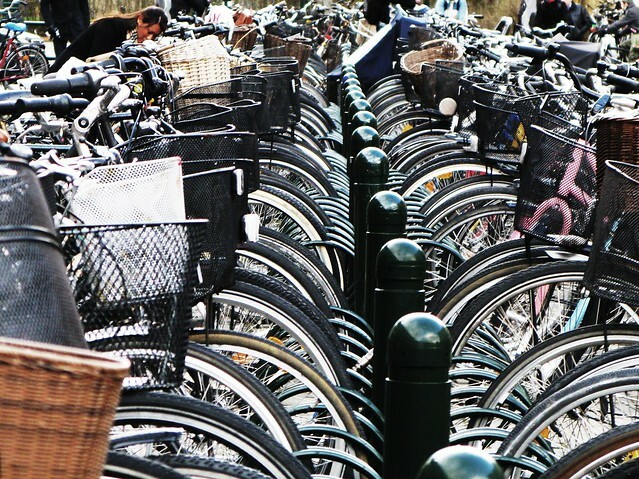 We've translated the guidelines for bicycle infrastructure and bicycle parking below. 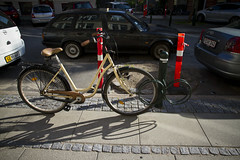 There are variations and creative additions to the guidelines in the urban space here in Copenhagen regarding bicycle parking, but the infrastructure part is carved in stone, by and large. Cycle tracks along roadways must be fortified areas with asphalt. They must have a fall of 1/50 towards the sidewalk. 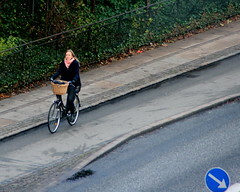 A curb is placed on the roadway side (fas curb) as well as the sidewalk side (kløvet curb). Cycle paths in parks and nature areas must be (if they are shared with pedestrian paths) constructed as a separate path and be fortified with black/grey OB surfacing. Cycle lanes are marked with 30 cm wide, white striping in thermoplast. The bicycle symbol is placed at the beginning of the stretch and every 30 metres afterwards. 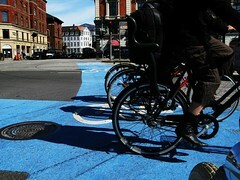 In intersections where cyclists are especially vulnerable, the whole lane can be marked with blue thermoplast. 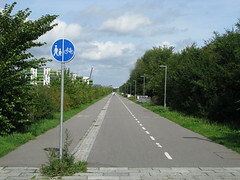 Bicycle routes are comprised of a connected network that continuously runs in its separate lane of at least 2.5 metres in width or along the car lane. The routes are fortified areas in asphalt. 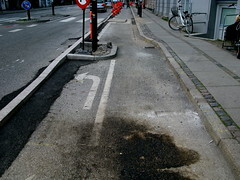 Asphalt is used in traffic areas (cycle lanes and cycle tracks) in accordance with the positive list from the Technical and Environmental Department's Road Laboratory. OB Surfacing is used on, among other things, shared pedestrian and bicycle paths in parks, where the surfacing must be corn coloured. When paths are more than four metres wide, a separate bicycle lane is implemented in black/grey OB surfacing. Here is a cycle track being built. 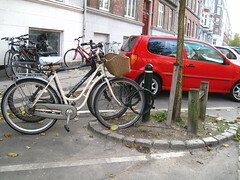 Bicycle racks are placed in the public urban space for short term parking. 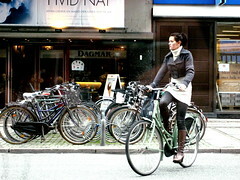 Bike racks are placed close to shops, stations and other traffic nodes. The rack must be faced away from the the road or cycle track. The bike racks can be placed on sidewalks in the inventary zones (city inventary like garbage cans, etc), along walls or on the roadway. 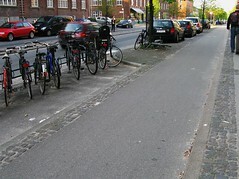 When the bike racks are placed on the roadway, the area must be striped with 10 cm wide frame. Bike racks must be equipped with reflectors. As protection against car traffic, a number of bollards with reflectors must be implemented. 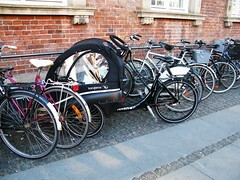 When the bike racks are placed along walls, the rack can be mounted on the wall itself or placed in the sidewalk, for example with 90 or 45 degree parking. When a housing collective or a shop owner applies for permission to put in bike racks, the Design Manuel's rules must be followed. 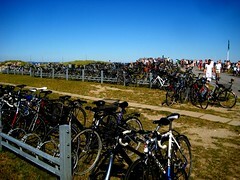 The bike rack "NO Series" comes in modules of 2.5 metres in length. Single-sided versions have five parking spots and double-sided ones have ten. The racks are set up in chains of max. four connected modules - 10 metres in total. There must be 1.6 metres distance to other city inventory. The rack is mounted on a bollard of either 0.6 metre or 0.8 metre in height. The bollard is placed in the ground. The rack is used in galvanised steel due to durability. In the City Centre and other historical areas, one of the identity colours can be used out of consideration to architecture. In the NO Series, there is a circular version that can be adapated in size to the location.